“Veera Vinayaka” and all other songs suddenly start out of nowhere absurdly. The ‘intro song’ actually has no elements of an intro song in the music, the lyrics, the visuals whatsoever. Just the hero and some dancers dancing around in poorly built sets, with pointless choreography and editing. It is “Aaluma Doluma” that steals the show. One wonders though, why the words “AALUMA DOLUMA” are shown on the screen a couple of times. As we sit back prepared with the mindset that this is going to be a typical masala flick, where the hero is going to chase the villain shown in the first scene to finally defeat him in the end, the film doesn’t offer enough reasons to empathize or even refrain ourselves from running out of the movie hall for the least. As Soori still believes speaking English with imposed wrong pronunciations is funny, ‘Siruthai’ Siva & co thinks making the camera swing wildly around the characters and the scenes makes the film racy. The bad guys are so supernaturally wicked that they trace the hero down with the help of GPS even accurate to the third dimension as they find on which floor he is from the data. No, that is only how supernatural the villains can get. 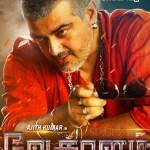 As Ajith enters the scene, he dodges bullets from fifty gunmen as he walks horizontally on the wall nearby. So you think only the villains and heroes can get supernatural? Now Shruti Hassan suddenly runs into the scene out of nowhere. And then, Ajith breaks the thick glass that guards the outdoor of skyscrapers in a couple of punches. When one of the girls kidnapped by the women trafficking gang commits suicide in what seems to be nighttime, goons are sent out with orders to find a new girl for replacement immediately. They ‘immediately’ run out and find Lakshmi Menon who is walking around in bright daylight. As Laskhmi Menon loses all memories, the hero still knows who killed her blind parents. Towards the climax, the villain talks to the hero about his sister being sent away just as casually as a passenger from a moving train would bid adieu to the friend who has come for a sendoff. And Ajith, maintains continuity and listens carefully to the villain, like a man running along with the train, throwing away goons in the process like dodging vendors on the railway platform. In the end, when ‘Kolkatta Kaali’ comes to Ajith’s rescue the camera goes around the idol wildly, and you relive those Ramanarayanan-Amman films for a while. 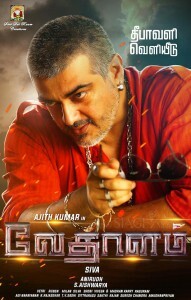 Ajith’s greatest attribute is his charming look. The way he looks in the second half, in the supposedly intensifying flashback, strikes out the last reason for you to enjoy the film. The actor proved his multifaceted talents in acting with ‘Yennai Arindhaal’ earlier this year. The way he tries some different acting in this film-especially in the second half- goes terribly funny, you rather start missing Soori. The film has a really strong crew in Ajith, Anirudh, Lakshmi Menon, Editor Ruben and turns out like a typical Vijayakanth, Perarasu, J.K.Ritheesh, T.Rajendar film of the previous decade. There is no element that is attractive enough to relate to the current commercial audience. Anirudh’s background music may impair the hearing ability of one of your ears if you watch it in an ordinary theatre, or both ears if you watch the film in a theatre with good surround quality. Shruti Hassan has different voices dubbed in the first and second halves. This film might find a place in the top three if a list of (masala) films with the most clueless editing and pointless screenplay in the recent past is made. The film has some obscene, fun-intended comments on Shruti Hassan by Swaminathan, a song with the camera placed between the female lead’s legs at a low angle, in a song that follows the scene that she falls in love with the hero, and then you see the dedication card to women in the end. The amount of work put in to frame a trivial story, screenplay and visualizing it, and the basic honest attitude in presenting a normal masala film is where this film fails to match the rest of the watchable, contemporary masala films. It has been decades since the Tamil audience lost taste for such films. Tamil masala films have evolved. A commercial film is one that is made with a few compromises in filmmaking. Films that compromise even the attributes of a commercial film, and look like a pointless collection of random videos, failing to serve the basic quality of commercial entertainment, defending themselves with the label ‘masala films’ surely look absurd. Mahesh Raghavan is a film buff and independent short filmmaker from Chennai. His interest for films of all genres and languages has grown over the years. One film a day is his thumb rule.